P&W-funded Regie Cabico is the coeditor, with poet and novelist Brittany Fonte, of the recently published anthology of queer poetry and spoken word, Flicker and Spark (Lowbrow Press). His own work has appeared in over thirty anthologies, including Aloud: Voices from the Nuyorican Poets Café, Spoken Word Revolution, and Chorus & The Outlaw Bible of American Poetry. He received the 2006 Writers for Writers Award from Poets & Writers for his work teaching at-risk youth at Bellevue Hospital in New York. 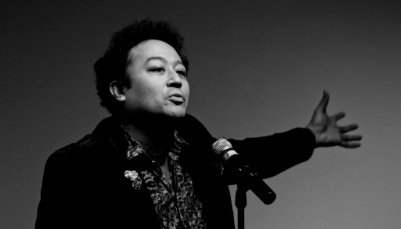 He is a former Artist in Residence at NYU's Asian Pacific American Studies Program and has served as faculty at Banff's Spoken Word Program. He resides in Washington, D.C.
For the last three years, I have been working with the D.C. Commission for the Arts on Poetry Out Loud, A National Poetry Recitation Competition. This year, I have worked primarily with McKinley Technological High School and Latin Public Charter School. My job is to help students find their unique interpretations of poetry selected by Poetry Out Loud. The competition goes from local high school, to the state level, and then to the national competition. I am amazed by the students’ choices of poems: What lures a teen poet to John Keats or Anne Bradstreet? Students in the state and national competitions must memorize three poems and one of the poems has to be from the nineteenth century. For a long time, I resisted Poetry Out Loud as a contest that was removed from the poetry slam. I thought that the required poems were antiquated and out of touch with the students' racial and/or economic backgrounds. For decades, I taught at-risk teens at Bellevue hospital with Tina Jacobson. I know that young people can write and perform poetry that is closer to their experience and also ends up giving voice to unrepresented and marginalized youth. I am inspired by the librarian Sarah Elwell, who is a magnet for students. Ms. Elwell tirelessly brings speakers and artists to the library to inspire them. Lisa Pegram is a teacher with whom I have worked as D.C. youth slam coach. Ms. Pegram aka Lady Pcoq is a musician, poet, and playwright who gets to engage her students in artistic explorations through the Poetry Out Loud program. Ms. Pegram and I have students record themselves on their iPhones, create broadsides of their poems, and categorize each word of their poems by noun and verb so that they are able to understand every word they're memorizing. With Ms. Elwell, I have turned the library into a literary and performance playground. The goal is to get students to live the poem and dive into the world of the images they are reciting. I have to get them to engage in the musicality of the text and also create a story for them to fall into. On March 5, 2013, I prepped students at McKinley High School. The Daughters of the American Revolution, the D.C. Public Library, and the Washington Teachers Union were represented as judges. Fifteen students competed, and the poems moved quickly because poems were short, unlike a slam where there is a three minute limit. Then, it moved from fifteen to six poets. I had worked with all of the six poets but one. Students got up and forgot lines, but the student body was supportive. In the end, Tshala Pajibo, an eleventh grader, won. She was not the most polished performer, but Ms. Pajibo exhibited focus and made a physical stomp and her vocal strength, as well as her dynamic performance choices, made the audience jump. She performed Maya Angelou's poem, "I Know Why The Caged Bird Sings." When I worked with Ms. Pajibo, I asked her to "visualize" the bird and tell the story of the bird. Ultimately, there is a value to taking something that you did not write and interpreting and finding a story in it. There is value in memorizing Emily Dickinson or William Blake in order to move through history and time. It brings a lineage to a slam poet's performance. It encourages them to write outside of the box, and it provides another set of diction for the artists to use. One of the categories in the individual poetry slam competition is the “One Minute Poem.” Poetry Out Loud is full of poems twenty-five lines and under. I hope poets who are working on their one-minute poems will take a look at these poems for inspiration. As a former musical theater major, I had to find songs that I could perform well for auditions. I have as much joy finding poems that suit me. I would love to perform the work of Robert Creeley, Stuart Dybek, and Henry Wadsworth Longfellow. Who knew? I am grateful to Carlyn Madden at the D.C. Commission for the Arts who brings so much care to arts in education in Washington D.C.
Photo: Regie Cabico. Credit: Carlos Rodriguez. Support for Readings/Workshops events in Washington, D.C., is provided by an endowment established with generous contributions from the Poets & Writers Board of Directors  and others. Additional support comes from the Friends of Poets & Writers .